This web page is dedicated to all A.S.L.E.F. 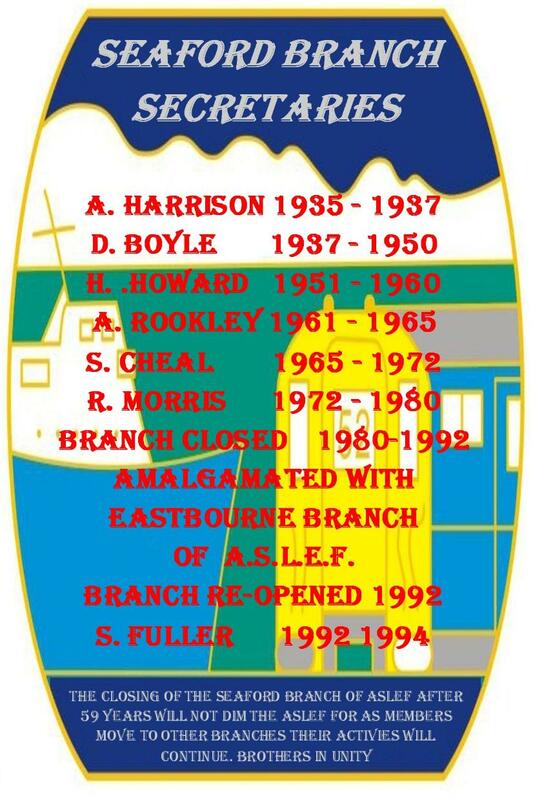 members who have worked at Seaford depot over the years, and it features A.S.L.E.F. 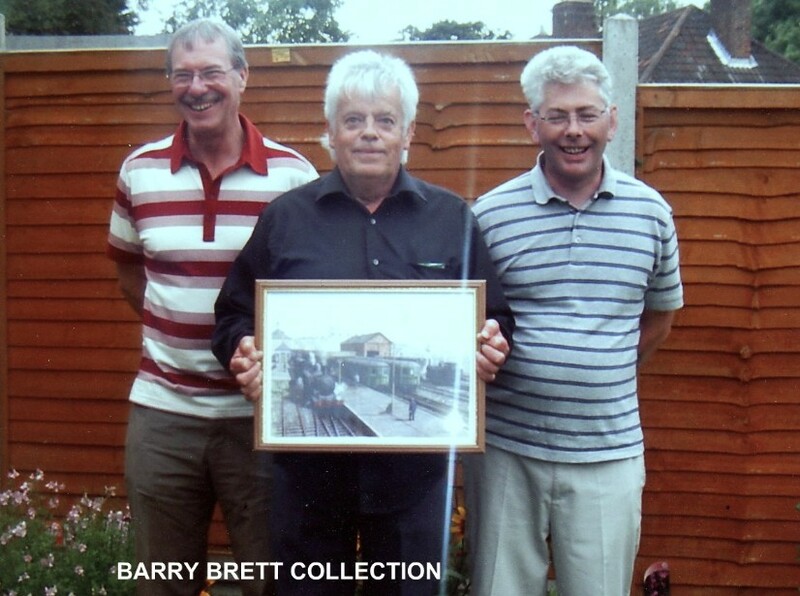 members who brought the trains of Seaford to life. The Seaford Branch of A.S.L.E.F. opened on the 18th August 1935 and closed on the 13th February 1994, from 1980 ~ 1994 the Seaford Branch had been closed, with the membership being transferred to the near by Eastbourne Branch of A.S.L.E.F. The above badge is the Seaford A.S.L.E.F. "Depot issue" 1982 strike 100% loyal badge. 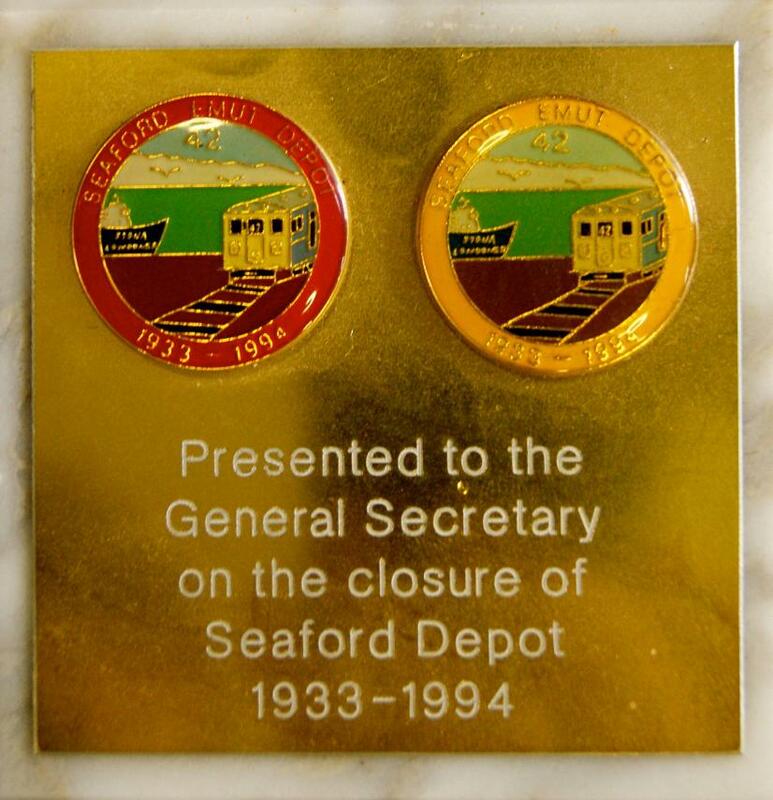 Only twelve of these badges were made, and below a second batch was made for general sale to non Seaford A.S.L.E.F. members. The badge features a 1963 E.M.U.T. train, which is carrying a 52 Head Code (London Victoria - Newaven Harbour (Boat Train)/Seaford), and the Sealink ferry Senlac. from the near by Loco shed at Newhaven. 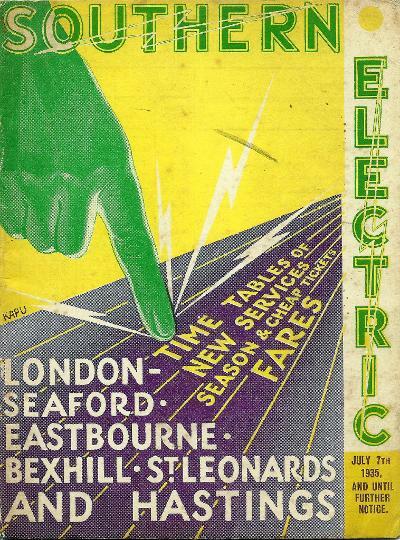 With electrification reaching Seaford in 1935, a motorman’s depot was established at Seaford, with the new electric service officially opened by the Lord Mayor of London on the 4th July, with a public service starting on the 7th July. 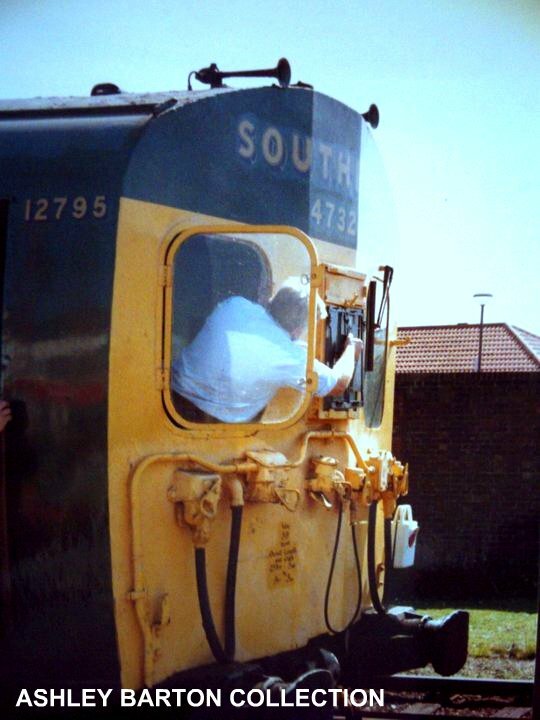 The majority of the motormen who took up the positions of motorman at Seaford, had previously been enginemen at the nearby Newhaven Loco Shed and over the coming years the vacancies at Seaford depot were filled by Newhaven 'Dual Link' drivers, who had opted to become motormen. This was the only way of filling the vacancies unless a motorman from another depot had placed a transfer to another motorman's depot. A special meeting of Seaford's motormen was held at Pelham Place on Sunday 18th August 1935, with District Organiser Bro. J. V. Sweeney being in attendance, along with members from the Battersea Branch, Bros. G. Walters, J. Satchwell, A. Cooper, & A. Avis. The meeting decided to elected Bro A. Harrison to become the Branch Secretary and F. Wilmshurst to become the Branch chairman.The District Organiser then went on say "how advisable it was for all depots to be in close touch with the General Office to get first hand information on all matters"
I have also attended meetings at Yarmouth, Hampstead (for a conference of L.D.C representatives), and at Seaford. The latter place has been made a depot in connection withe the electrification of the Southern Railway. Bro. A.E. Harrison migrate there from Battersea, and it was not unexpected when overures came from him for the opening of new branch. The usual arrangements followed, and at the inital meeting we were favoured by the attendance of Bros. Joe Satchwell, George Walters, and other members of Battersea branch. Just like a cameo of old times to see our members travelling about to attend meetings. The Seaford Branch was declared open, with Bro. "Bert" Harrison as secretary, and Bro. F. Wilmshurst as chairman. We all join in greetings to this new branch of the Society. Bro. F. Wilmshurst in attendance only (no meeting). A discussion arose over the Chairman & Secretary being elected Pro Term explanation given it was then moved by Bro Stedman and seconded Bro Garman, Bro. F. Wilmshurst be Chairman for the ensuing year. Carried. Pro Bro Tucknott Sec Bro Stedman A.E. Harrison be Secretary for the ensuing year. A discussion then arose re Standing Orders, the time & re future meetings, Proposed Bro Tucknott and seconded Bro. Stedman, meetings be held at 9 Pelham Place, at 11. a.m., first Sunday in each month. If insufficient members are in attendance to form a quorum books closed at 11.30 a.m. should there be a meeting same to close at 12.30 p.m. Carried. Proposed Bro. Stedman and seconded Bro Garman with the exception of item No.1 we adopted Battersea Branch Standing Orders. Carried. Proposed Bro. A. Harrison and seconded Bro Tucknott that 3 members become a quorum owing to our small Branch. Carried. Proposed Bro. E. Tucknott and seconded Bro Garman, that Bro Stedman be Check Steward. Carried. Proposed Bro. E. Tucknott and seconded Bro H. Stedman. "That Bro. A. Harrison be Insurance Agent". Carried. Proposed Bro Garman and seconded Bro.H. Stedman. That two off each shift become Committee members,Bro. W. Smith & Bro. A. Pearce, Bro. Scott & Bro. E. Tucknott. Proposed Bro. H. Stedman and seconded Bro. E. Tucknott. "That, A. Potter & G. Sargent become members of this Society". Proposed Bro. H. Stedman and seconded by Bro. E. Tucknott. "The Secretary approach the Company for T.U. notice board as soon as opportunity arises for hanging of same." Bros. H. Stedman & E. Tucknott. A discussion took place on the question of having a suitable room for Motormen to make out returns, F.&F. likewise the availability of suitable means of obtaining drink water and lavatory accommodation, wash bowls etc. It was mentioned the most suitable place would be the General Waiting Room it was then moved by Bro. H. Stedman, seconded Tucknott, "the Secretary write Mr. H. Jones direct re above". Carried. It was decided to lay correspondence re-election of Organising Secretary on table for next meeting. Correspondence read by Secretary to the Company Head Office & letter from Head Office to Sir H. Walker re the very dirty state of cabs front windows and reference to a saw dust & eyesight. Moved Bro Tucknott and seconded Bro. H. Stedman, "We endorse Secretary actions compliment him on same". Carried. A discussion then arose, re look out windows in cab, it was decided for Secretary to get in touch with General Office, and other Depots to endeavour to get size of same reduced owing to size and braking same with a view to minimize the danger to motormen and means be provided for cleaning same. Agreed. To discuss letter from Bro. Lewery (B’ton No. 2 Branch), Re- Xmas, & Good Friday, Holidays, & Representation. Bros. A. Pearce, A. Potter & W. Smith. After discussion & letters read from Bro. W. Lewery, moved Bro. Potter, Sec. Bro. Pierce. Then men that work Xmas day be off Boxing Day this to be worked in a cycle. That is to say no man to be off duty a second time before cycle is worked through. No leave of absence be granted unless representatives agree. Carried Unanimously. Moved Bro. Pierce, Sec. Bro. Potter. That a draw be held in public 7 early turns, being 1 to 7 A, late being 1 to 7 B, this cycle be sent to Waterloo for their guidance for booking men off on above days. Carried Unanimously. Moved Bro. Smith, Sec. A. Pearce, "That Good Friday be worked on and a separate draw be taken for same". Carried Unanimously. That we agree Secretary write out above and all men be asked to sign in favour of same. Moved Bro. A. Pearce, Sec. Bro. A. Potter. "That this Branch is in agreement with the Machinery of the Rail Act 1921 (I E) two Depots Representatives for Ore, Eastbourne & Seaford. It was then put to meeting. We have confidence of Secretary dealing with the above business on our behalf. This is in reference to Mr. Roberts remarks to Bro. W. Lewery. Carried Unanimously. Bro. W. Lewery then entered the Branch Room straight from work and gave explanation of what transpired at L.D.C. meeting 19th Nov. The secretary was then asked to write Bro. Jeans, asking if he could produce any minutes of Sec. Council re Mr. Roberts remarks. A vote of thanks to Bro. W. Lewery for coming over as above and for information he gave. At the meeting held on November 3rd a discussion took place as to some alteration being asked to be made for the benefit of the motormen's cab front windows. In the first place, it is hardly possible in a damp atmosphere or drizzly rain to see signals at the distance, and the appliances for cleaning these are not suitable, as at times they make them very smeary, and they are difficult to use with only one hand available, the other being fully occupied with Dead Man's Handle. This refers to all cabs except those fitted with air machines for working same. in the next place it was pointed out the unnecessay size of same, as at present when they get broken by birds, etc., a reduction in size may prevent this happening. Further, they could be made so that motormen could wipe outside. During the sunshine, again it would be helpful if it was reduced in size, giving the motorman opportunity of getting a view of signals without the glare of the sun penetrating through the window as at present, with reduction at the top of 8 or 9in., 4in. left side, 6in. right side, and 6in. at bottom of look-out front window motormen's side. It was likewise put forward the right side could be blanked, thereby preventing the possibility of same at any time any time being broken or the sun penetrating through as at present. I was instructed to get views of other motormen's branches, in particular the men working main line trains. This will no doubt be well discussed, and with that in view I am asking our Editor to published same, I may then receive the opinions of a number of motormen. Bros. A. Pearce & W. Smith. Moved Bro. W. Smith and seconded Bro. A. Pearce, "The Secretary be empowered to take up any matter that requires immediate action and we the members will fully support in same". Carried. Moved Bro. A. Pearce and seconded Bro. W. Smith, Secretary write Mr. Roberts asking for information Re-L.D.C. & Re-grouping likewise for improvement on covering of seats in cabs. I am pleased to report good attendance at our last meeting, and a very interesting subject was discussed. The members decided unanimously to adopt Page 16, Clause 1, Establishment, and have representatives from Seaford, eastbourne and ore, pending the further extention of electrification. so well so good. On December 1st, along with others,invaded Ore and had a very pleasant three hours where the above was also agreed to, but the important item of the day was the opening of a branch there, and it gave pleasure to those who paid a visit. Ore to see all possible roll up to open this branch. I hope this is another strong link in our cable. Bro. J.V. Sweeney, previous to the opening addressed the meeting, and particular laid down the necessity of these extra branches, thereby being able to receive first-hand information from General Office. a vote of thanks to him and visitors concluded the business. Also good wishes to my scattered Brothers ex-Army, and others, for Year 1936. Bro Bert Harrison, motorman, Southern Railway, and his dog, which regularly takes his food to him on duty and takes home the basket. Bros. A. Scott, A. Pearce, G. Oram, W. Smith & E. Watson. Moved A.G. Scott and seconded G. Oram. "This depot support No. 5 L.D.C. in the steps they have taken Re Alteration of Holiday Roster (August) as statistics were taken last year and did not warrant the Holiday Period being broken in this area during the Sussex Fortnight". Carried Unanimously. Re letter from Mr. Auliff. Moved Bro. A. Pearce and seconded Bro. E. Watson. "That we at this Depot arrange any alteration of Holidays mutual between ourselves, letter be sent Bro. W. Lewery & Mr. Auliff ". Carried Unanimously. After correspondence read re Representation L.D.C. and Moved Bro. W. Smith, and seconded Bro. A. Pearce. "We fully support Secretary’s action in dealing with above". Carried Unanimously. Moved A. Pearce and seconded Bro. A.G. Scott. "We appreciate the manner Secretary had dealt with the business on hand". Carried Unanimously. Moved Bro. H. Stedman and seconded Bro. E. Tucknott. "We the members effected by the letter from Herbert Jones re Holidays, determine that this matter must be dealt with under the Rail Act 1921 & Appendix therein by L.D.C. 5. The secretary be instructed to forward this resolution to Executive Committee and Secretary of Sectional Council No.2 and ask for immediate action be taken owing to Hebert Jones determination of application for date being laid down for March 31st. We are very definitely for this being effectively dealt with. We are disgusted with the action taken up to now by our General Office". Instructions from Station Master for all other grades to be kept out of same (to be noted) 17 in lobby at once). Moved Bro. E. Tucknott and seconded Bro. H. Stedman. "A letter be sent to Gen. Office for them to still press for a lobby for our own requirements". Carried Unam. We are still on the map, and our last meeting very important business discussed. Holiday question, the Electrical Engineer has taken from us the second week in August without the matter being settled through the L.D.C. No.5. The next was the dirty state of motor cabs on the Eastbourne, Ore and Seaford extension, and in particular the very dirty state of look-out windows, motorman's driving side, likewise the neglected state of the window cleaners, that is to say it is impossible to clear front of glass through same being either worn out or in other words perished. Whilst we do not admot the present ones are of any use for what they are there for, we have suggested a better kind should be supplied. In the meantime, we do think some attention should be given to our complaint, as this is very detrimental to the safe running of trains, especially under weather conditions of the last five months. Antohervery important question came up, re necessary accomodation for motormen and convenience at Seaford Depot, which we do hope our E.C. will do all in their power to obtain, as in our opinion this is urgently needed. I have to report a forward move in Seaford, that is we have had the first public meeting for local Council election, whilst we were not successful in gaining a seat with our one candidate we had a very goood number vote Labour. Better luck next time is our motto. After a lengthy explanation of the situation and letters from General Office, F Jeans, Herbert Jones. Moved Bro. A. Pearce and seconded Bro. H. Stedman. "We the motormen of Eastbourne, Seaford, Ore, Brighton & West Worthing supported by the London District call upon the E.C. to act immediately take up with S.R. Company our requirement having failed to get satisfaction through correspondence to Sectional Council Secretary. To press our claim for Representation the attitude taken by Herbert Jones against the agreed machinery, further the non-attention to genuine report". "We call upon Gen. Office to allow a Central meeting of Motormen to deal with questions, effecting all Motormen on S.R. Railway". Moved H Pearce, Sec W. Lewery. "Secretary send letter to reach Bro. J.V. Sweeney by Friday mornings post (re cancelling meeting)". Moved Bro. F. Wilmshurst and seconded Bro. H. Stedman. "A hearty vote of thanks to visitors". & Bros. H. Stedman & A. Scott, Bro. J. V. Sweeney in attendance. The position was generally discussed re previous weeks resolution, Bro J. V. Sweeney promised to lay the position before Gen Office and he would arrange meeting on 7th or 21st June at the Labour Club Brighton. Bro. J. V. Sweeney in attendance. Meeting as above held at Brighton 21st June at 2.30 p.m. adjourned after lasting 3 hours until 28th June 10.30 a.m. & 6.30 p.m.
& Bros. H. Stedman & A. Scott. Owing to this coming on the monthly meeting a meeting was held on 23rd June to decide on candidate for Sectional Council. Moved H.F. Stedman and seconded Bro. A.J. Scott. "That Bro. A.E. Harrison be nominated for our Sectional Council No. 2". Special Meeting Held at Brighton 10.30 a.m. 6.30 p.m.
"That this main meeting of Motormen, view with grave dissatisfaction the delay with which the complaints of Motormen are dealt with, and are of the opinion that in its present operation the machinery is inadequate to deal with such complaints. We express the opinion that the number of appointed representatives of Motormen is inadequant and that immediate steps should be taken by the Society to increase the number of L.D.C. from 5 to 6". "Further we suggest that consideration be given to the setting up of a separate Sectional Council for Motormen for the purpose of speeding up the settlement of matters in dispute by representations competent in technical knowledge of varying subjects". "Further in view of our increased numbers we express the opinion that we should be given increased representation on the E.C." "Further with a view to assisting the E.C. and the Sectional Council to promote these objects a Motorman’s vigilance Committee be appointed for the purpose of collecting necessary facts and submitting them to the proper authority". "We ask the E.C. to obtain this or suggest some better method whereby the business can be carried out more quickly and satisfactory". Report given by Bro. A. E. Harrison Secretary of L.D.C. No.5, on agenda & meeting with Company Side on Tuesday 20th. Same acclaimed satisfactory. It was suggest Secretary inform other Depots of items struck off agenda re 1900 Class units*. Secretary write General Office Re grouping of Ore Motormen’s Branch Re A.A.D. Delegate. Proposed Bro. F. Wilmshurst and seconded by Bro.W. Smith A.E. Harrison be nominated as Delegate to 1937 A.A.D. Pro. W. Lewery (B'ton No.2), Sec. A.J. Scott, Bro J. Goodyer be Chairman. The Secretary then explained reason for calling meeting. Bro. J. V. Sweeney then addressed the meeting in particular on Representation, E.C., Sectional Councils and the possibility of the E.C. sanctioning a meeting of the 5 L.D.C’s on Southern Railway. Moved Bro. H. Stedman, Sec A.G. Scott. No. 1 "That this meeting of the members of Seaford Branch call the attention of the E.C. to the continued developments and extension of Electric Train working on the Southern Railway. In order that our Motormen members may have complete confidence in the Society and adequately safeguard then interests we make application for E.C. to sanction a conference of the five elected L.D.C.’s on the Southern Railway for the purpose of confiding their respective minutes and agreeing on a common policy for the future." Carried Unam. Moved E.G. Tucknott, Sec. A.E. Harrison. No. 2 "That this meeting of members of Seaford Branch view with apprehension the speedy development of electrification on British Railways and particularly not that work is already in hand for electrification between Liverpool & Sheffield on the L.N.E.R. We express the opinion that the E.C. should immediately review the constitution of representation and suggest that more than one position should be allotted to Motormen on the Executive Committee. Further that the Society inaugurate a movement for a revision of the scheme of Sectional Councils with the view of a separate Council for Motormen on those Railways where electrification is a declared policy. Further, that the question referred to in this resolution be treated as items of emergency from the E.C. be submitted to the 1937 A.A.D". Carried Unam. A vote of thanks to Bros. J.V. Sweeney, Chairman and visitors. Moved Bro. H. Stedman and seconded by Bro. A.G. Scott. "We have every confidence in our Chairman Bro. F. Wilmshurst". Moved Bro. E. Tucknott and seconded by Bro. H. Stedman. Officers be elected en block. Explanation given by Secretary re Head Office letters and the necessity of a resolution, moved Bro. A.G. Scott and seconded by Bro. H. Stedman. "Having discussed Railway Staff Tribunal findings No.2. We are of the opinion that the re Assembled Delegates should press for restitution of all cuts and 12 days holiday with pay each year." Carried Unam. A discussion then took place re booking of Xmas Day & Boxing Day. Bro. F. Wilmshurst waived his right to any preference for 1937. Secretary A. Harrison & Bro. A. Pearce attending evening meeting, Bro. A. Pearce attended evening meeting and supported morning minutes. This amendment to Battersea resolution be sent to General Office for A.D.D. May 1937. Add to and that provision be made for increased representation on E.C. Further that consideration be given to the setting up of a District Council for Motormen only. with a fair percentage present. The question of appointing a Secretary was discussed, owing to Bro. Harrison resigning not being able to get anyone to take over same the following resolution was carried unam. 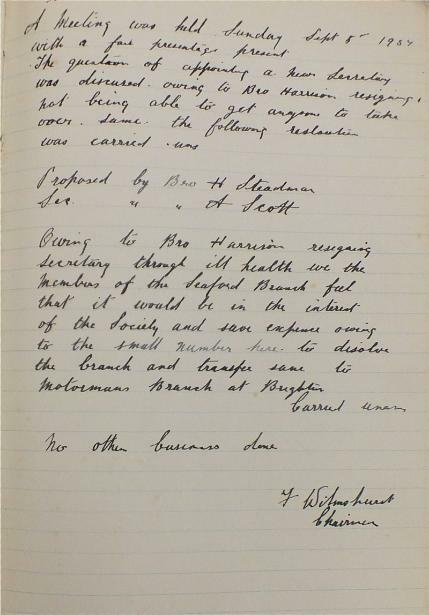 "Owing to Bro A. Harrison resigning through ill health, we the members of the Seaford Branch feel that it would be in the interests of the Society and save expenses owing to the small number here to dissolve the Branch and transfer to Brighton No. 2 Branch." Carried Unam. Present Bro. Sweeney Organising Secretary, F. Wilmshurst Chairman, H. Stedman, E. Tucknott, A. Pearce, W. Smith, D. Boyle & A. Harrison. To consider the resolution of the previous meeting. Re closing of Branch owing to position of no Secretary. Bro. F. Wilmshurst stated the case and read correspondence from Head Office stating that it was contrary to their principle to close the Branch. Bro. Sweeney spoke for some length on the case and expressed his wish that the Branch should be kept open. After a lengthy discussion it was moved by Bro. E. Tucknott and seconded Bro. D.O. Boyle that the resolution be rescinded and the Branch remains open. Carried. It was then moved by Bro. A. Pearce, and seconded by Bro. H. Stedman that this meeting be the general meeting and elected Officers for 1938. Carried. 3 members attended. Brother E. Tucknott, H. Stedman Chairman & D. Boyle Secretary. Correspondence read by Chairman Bro. H. Stedman, which was discussed by those present. A discussion was held re Underground Railways action regarding Christmas day, it was agreed that suport be given to this action by all branches for the benefit of all concerned. Members present F. Wilmshurst, A. Scott, A. Potter, A. Pearce, E. Tucknott & J. Brock. Impromptu meeting held in messroom at Seaford to discuss letter from C. Branson in relation to Christmas leave, when the following resolution was forwarded to Head Office, moved by Bro. F. Wilmshurst and seconded by Bro. A. Scott. "That unless guarantee is given that all Motormen shall be booked off duty either on Christmas day or Boxing Day, we intend to withdraw our labour on both days." Carried Unanimously. Moved by Bro. A. Scott and seconded by A. Pearce. "That Chair H. Stedman and Secretary D. Boyle, Committee F. Wilmshurst, E. Tucknott & W. Smith continue in Office." The 12 days holiday with pay and Condition of Service, discussed. Proposed by Bro. A. Rookley & Sec. by Bro. A. Scott. "That as our Conditions of Service are a guaranteed 8hrs, and with an 11 day fortnight, constitutes 88hrs. we urge Head Office to further examine our Conditions of Service in the light of the relationship of 12 days holiday with pay to the 88hrs fortnight constituting an 11 day period, and as one day of the 12 day holiday period (i.e.) from Monday to Saturday is a rest day, we press that either 11 of the 88hrs period be paid or one extra day holiday be granted." Carried unanimously, this resolution be sent to Head Office. The next item came on behalf of Bro. A. Pearce, through the Chairman, seconded by Bro. A. Rookley. That as more Guards and Station staff were now employed at Seaford, was as a Branch press for the opening the question of *messroom for Motormen only, as the present room shared with other staff is unsuitable. Secretary instructed to report the matter to both the L.D.C. and Welfare Officer. Brother Stedman appointed to meet any person in whom authority is vested, to deal with the matter." Members present, Bros. H. Stedman, D. Boyle, A. Rookley, & A. Scott. Transfers of Motormen, Bros. Bush, Howard & Sharp endorsed. Proposed by Bro. A. Rookley & Sec. by Bro. A. Scott. "That as our Conditions of Service are a guaranteed 8hrs, and with an 11 day fortnight, constitutes 88hrs. we urge Head Office to further examine our Conditions of Service in the light of the relationship of 12 days holiday with pay to the 88hrs fortnight constituting an 11 day period, and as one day of the 12 day holiday period (i.e.) from Monday to Saturday is a rest day, we press that either 11 of the 88hrs period be paid or one extra day holiday be granted. Carried unanimously, this resolution be sent to Head Office." Officers for 1949 - 50. Members present Bros. H. Stedman, A. Rookley & D. Boyle. Matter arising, Conditions of Service, 12 days holiday with pay. Secretary read letter sent to General Secretary re same and answer noted. Bro. Rookley criticised what he considered to be the apathy of Head Office in this matter. Election of Officers for 1951 was discussed at length, moved by Bro. A. Scott and seconded by Bro. D. Boyle. "That the small attendance renders it undemocratic to proceed with election. Therefore we consider it to be in the best interests of the Branch for the other shift to be given an opportunity of having a seperate meeting when no doubt the attendance would be larger." Chairman Bro. Stedman & Bro. D. Boyle Secretary are both willing to serve in capacity in the interest of the Branch. Request from Bro. Allington, through Secretary for advice about the position of Motorman waiting for their final move to their home station, because of the manner in which the opportunity to do so is being retarded by the interpretation by Sectional Council No.2 of certain clauses in the new promotional scheme. some discussion took place on this matter and it is considered most in just for Motormen in such positions to be required to take their seniority with the dual link. Secretary instructed to write to Head Office. W. Share, R. Bush, S. Howard & A. Pearce. A meeting held at the Community Centre on January 30th 1951 to assist the election of Officers for 1951, Bro. A. Pearce in the Chair. Correspondence: Rules Examination, Footplate Staff Wages application & enhanced Payments Railway staff. Conference, General Matters, eyesight & ill health failures. Payments between 2.0 p.m. & before 6.0 p.m. & 6.0 p.m. & 8.0 p.m. Efficiency & economy. travelling facilities on the Continent. Double Home work & Travelling facilities for children under 21 years old. Under any other business, speeds etc over Permanent Way, was discussed and letter from Head Office was read in regard to Bro. H. Stedman case. Bros. present R. Bush, W. Tansell, F. Wheeler, W. Mullett, C. Wickenden & A. Rookley. Also in attendance Fraternal Delegate Bro. S. Cheal Newhaven Branch. Secretary reported transfer from Newhaven Branch of C. Wickenden, & W. Mullett, Chairman welcoming same, also Bro. S. Cheal the Secretary of Newhaven Branch, present as a visitor. W. Sharp & H. Howard. Bro. Alf Pearce who is retiring was thanked for his services and wished a happy retirement from the members present. As from January 1st 1961 Bro. A. Rookley took over Branch Secretary voluntarily from Bro. H. Howard, whom wished to give up same. All books were handed over on January 5th, all members of Branch notified. This was an open meeting called to mark the presentation of H. O. token to R. Bush, Chairman for past 9 years and called at Station to give members at work and members of our contemporary union the chance to join in. a good number turned up, Newhaven & Eastbourne branches being represented. In making presentation Bro. Tansell spoke of Bro. Bush’s activities both as Chairman and also his work on the L.D.C. Other speaker Bro. S. Cheal, Newhaven and Secretary A. Rookley spoke in same terms. All present wish Bro. R. Bush all the best in the future. Bro. R. Bush thanked all present for turning up and for their wishes also H.O. for the Parker Pen & Pencil set. Bro. R. Bush stated he would not stand again as if a younger Chairman were elected more interest would be shown. Bro. Cheal raised a question re L.D.C and Branch work. Secretary report re District Council, letters from Head Office re closing of Seaford Branch and matters leading up to same. Happy to say that this matter has been shelved by Head Office. Members present Bros. V. Morris, H. Howard, C. Wilson, C. Wickenden, W. Tansell, W. Mullett & A. Rookley. Apologises Bro. S. Cheal, F. Wheeler & W. Sharp. Secretary reported that after receiving letter on Monday 11th June from Bro. Tansell re his resignation of Branch Chairman and L.D.C. Secretary. He called on all Committee for instruction and was given permission to do so and notified all members by letter. Chairman Bro. C. Wilson and seconded by Bro. W. Mullett. "The Secretary be Chairman for this meeting." Chairman opened meeting by reading letter of resignation from Bro. Tansell, and asked Bro. Tansell to speak on same. Bro. Tansell spoke on his reasons for same in as much as he was on various times and duties told what to do when on duty and criticised openly re same. Matters which should be conducted in Branch room and he certainly would not stand for this. Bro. Howard spoke on 810 duty being messed about with by roster clerk and nothing done about it also item 23 not being rescinded. Bro. Tansell stated he had verbally given roster clerk instructions on this matter of 810 duty. Bro. Wickenden considered items should be taken up in writing by agenda and spoke on 810 & 808 duties,also 814 duty, extra time for locking up. Bro. Howard moved and seconded by Bro. Wickenden. That letter of resignation be accepted. Carried. Bro. Tansell stated he had written to Shed Master and was informed by same that Bro. Wheeler had also resigned from L.D.C. The Secretary reported he had not been notified by Bro. Wheeler either in writing or verbally. Bro. Mullett moved and seconded by Bro. C. Wilson. "That Bro. Wheeler's resignation be accepted in light of information given by Bro. Tansell"
New L.D.C. to act until end of 1964. Moved Bro. Howard and Seconded by Bro. Mullett "Bros. Wickenden and A. Rookley be new L.D.C. en bloc." Carried No further nominations. New Chairman. moved Bro. Howard and seconded by Bro. Wilson "Bro. S. Cheal be new Chairman, Secretary to write to Bro. Cheale for acceptance". No further nominations. Bro. A. Rookley, thanked Bro. Tansell for all his help to the Branch. R. Morris, C. Wickenden, W. Sharp & S. Cheal. Moved by Bro, D. Renville & Seconded by Bro. R. Morris. That the Secretary write to H.O. Requesting Bro. A.W. Rookley be allowed to continue membership over 65, as he has unbroken railway service acting as a Guard at Seaford. Head Office letter re Bros. A. Rookley. moved by Bro. D. Renville and seconded Bro. R. Morris. "That the Secretary write to Head Office requesting Bro. A. Rookley membership over 65, as he has unbroken railway service acting as a Guard at Seaford." Members present Bro. D. Renville, W. Sharp, H. Allen, V. Morris, S. Howard, F. Wheeler & S. Cheal. Strong feelings were expressed about the Society. Moved by Bro. V. Morris & Seconded by Bro. W. Sharp. That the E.C. Be informed that this Seaford Branch views with disgust the failure to obtain a negotiated settlement which will enable our fraternity to obtain a greatly improved Pension Scheme, and to use such militant action as is necessary to obtain our right to a retirement pension which will insure a far greater security and reward for the long service and social inconveniences which our craft demands. Carried Unanimously. It was agreed a list be posted on a Thursday if the booking clerks agreed, open to all at Seaford, it was hoped a 'Barometer' for each member could be obtained. That the amount collected was £8/14/- disappointment was expressed. Moved by the Chair & Sec. R. Morris That a Barometer be purchased for Bros. W. Brown & C. Wlison, suitably inscribed if possible. A letter on behalf of Seaford station enclosed. All members stood in silence in respect to Sam who is missed so much by us al. Bro. W. Sharp agreed to take a letter to Mrs. Howard from the General Secretary. Thank you Sam for you past work at Seaford. 85/1967 re:- Surplus Footplate Staff, 84/1967 & 87/1967 re:- Guards in Rear Cabs. This correspondence was dealt with very thoroughly which insured that every member understood the position, it was agreed the L.D.C. Copy of 87/1967 continued to be posted. Matters from the Rule Book, Electrified Line Book, Appendix, Supplements & Special. Notices, P/E.W., were discussed with the time available. It was agreed our members would not become involved with other Staff, Public Press etc. Agreed if in doubt work as normal on any point, contact Branch Secretary , who would phone H.O. Try to avoid being sent home, but Branch Fund would be started if necessary, among other issues debated, it was if spare or duty as required we would have to carry out duties from the Foreman Motorman Brighton. That the Secretary inform the Management that whilst this Rail Dispute continues, no Seaford Motorman will be working his Rest Day. Further, the Secretary to phone the Foreman Motorman as soon as possible. at the Royal British Legion Seaford. G. Hilton, J. Bowlden, M. Giles, D. Creasey, & S. Cheal (apologies from V. Harris). Chairman Bro. D. Renville welcomed Bro. Creasey to Seaford Branch and explained apart from two small items, the meeting would deal with the present Rail Dispute. All present had read the H.O. Correspondence relating to the dispute, which had been posted. All aspects of the dispute were fully discussed, the L.D.C. Secretary read the copy of the notice posted relating to today's Rail Closure. The Secretary explained the telephone conversation with H.O. It was agreed future developments as quoted nationally be accepted after secretary had phoned H.O. As an amount around £6/10/- had so far been collected for Bro. Sharp on his retirement. Bro W. Tansell kindly agreed he would see him to try and ascertain a suitable present. Moved by Bro. C. Wickenden & Seconded by Bro. D. Smith. That the Secretary apply for Branch Funds as per rule 36. Members present Bros. D. Renville, H. Allen, V. Morris, G. Hilton, F. Wheeler, & S. Cheal. This was dealt with first by agreement. Bro. Allen L.D.C. Chairman gave details relating to correspondence on Rest Day Working. At a meeting held on 25th September 1968 a reworded, un numbered item was handed to our L.D.C. And dated same date:- Submitted by Management 'Rest Day Working as necessary to meet traffic requirements. It was agreed the wording is unacceptable to Seaford Branch. Moved by Bro. F. Wheeler & Seconded by Bro D. Renville. That a list for Bro. E. Collington be arranged, a suitable present be obtained any deficiency be met from Seaford Branch Fund. It was agreed that should a presentation be made such arrangements be left to the shift he worked with as a Motorman & Guard. J. Bowlden, W. Mullett, C. Bird & S. Cheal. Those present were not prepared to accept the officers positions, the secretary said he was not prepared to carry on with the shift rivalry and that the positions of Assistant Secretary and Vice Chairman would need to be filled. It was clear that the A.G.M. Could not continue. It was clear that the 100% available from one shift with only the Secretary from the other (who had the mutual change of duties to attend) that matters had come to a head. The objections were that those present considered, one L.D.C. Representative for each was necessary. The Secretary suggested the Organising Secretary be asked to attend. The Secretary stated it was his duty to keep all members united, if this failed he could not continue as Secretary. The present Management were such who would take advantage of any rift and do all in their power to cause such rifts. It was agreed another A.G.M would be necessary and all present would attend another meeting. Secretary. The present Management were such who would take advantage of any rift and do all in their power to cause such rifts. L.D.C. Report Bro. C. Wickenden L.D.C. Secretary gave a full on 2 meetings at Waterloo, 1 at Southern House. An agreement sought to have payment made on loss of mileage on cancelled trains, weekend working etc., all coastal L.D.C. 's from Ore to Bognor have formed a group. No Rest Day Agreements, no overtime when cover. Wages facts from L.D.C. Meeting at Waterloo. Moved by Bro. D. Renville & seconded by Bro. C. Wickenden. "That this Seaford Branch is disturbed and feels militant by the fact that the mileage rate paid to London men is calculated at 369/-, and discriminates between all other outside who receive 351/-, and yet continue to work trains over the same roads at the cheaper rate." Carried. Fred Wheeler is seen relieving the Brighton Belle en-route, whilst the Belle was running on its farewell tour of the Central Division of the Southern Region. L.D.C. Report, Bro. C. Wickenden reported that the L.D.C. Wrote in reply to managements complaint on the booking on time of Bro. Lipscombe for Boat Train duty. On Friday next was attended a meeting re the mock up of alterations to London Bridge. Lett4er 21.3.1972 for S.C. 'B' re L.D.C minutes re loss of work to Littlehampton, walking times at Lewes and alterations to duties. Walking time at Newhaven Harbour and letter written by L.D.C.Secretary regarding the use of M.L.V. Being used to cover the 06.05 Boat Train, this caused a very long and heated discussion in which all present took part. The Branch Secretary was called to order, although unpleasant the serious position Seaford was in as a Depot was accepted and the following motion was adopted. Moved by Bro. H. Allen & Seconded by Bro. D. Creasey. That the M.L.V. Be used to facilitate the passage of train crews between Seaford and Newhaven to bring about economies and to also eventually remove the need for a 'Staff Train running to Seaford'. Carried. 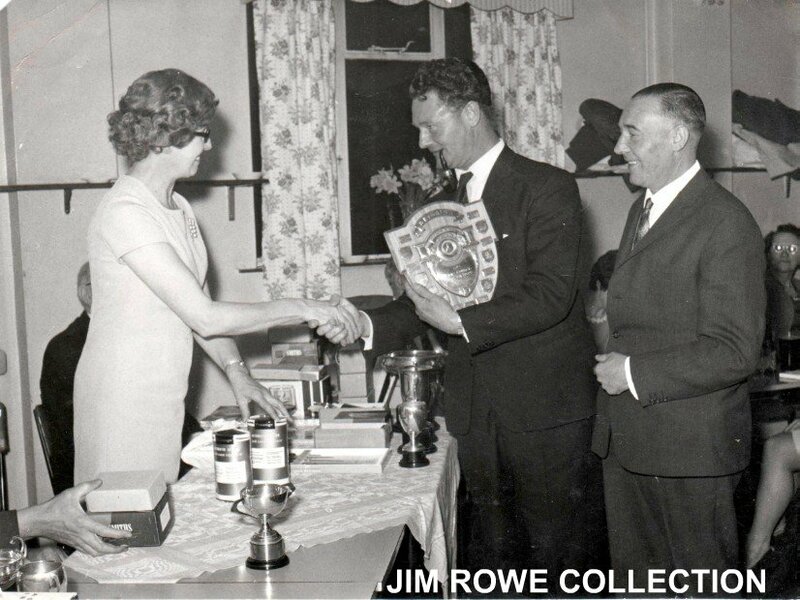 Organising Secretary N. Milligan & District Council 'B' G. Andrews. Members present Bros D. Renville, C. Wickenden, D. Creasey, G. Hilton, F. Wheeler, V. Morris & S. Cheal. L.D.C. Report. Bro. C. Wickenden reported on the Branch Resolution re M.L.V. Being used and gave an assurance that every was now being made to retain all Boat Train work at Seaford. The L.D.C. 's visit to a mock up at London Bridge proved to be very interesting the layout being explained, concerns was expressed by the Chief M.P. Inspector, that Seaford no longer had a duty to London Bridge, no sidings at London Bridge. 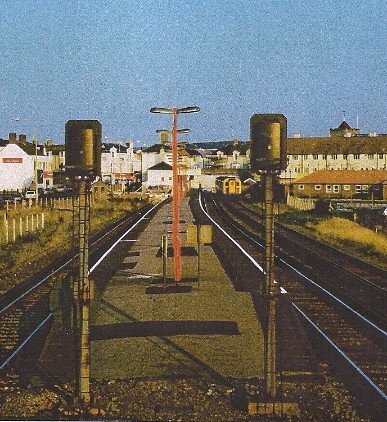 Other signal boxes to cover a wide area which would be another of the 13 for the Southern to be a Victoria 1976. Management expected trouble over Mess Rooms at London Bridge. Matters were discussed re spare coverage R.S.C. 514 and the booking on time altered on 521 duty to 08.21, it being agreed Seaford drivers would cover at all times as much of Seaford duties as possible, with Bro. Bird expecting a long stay away from work and in the event of another volunteer going sick, Bro. D. Renville agreed to volunteer to work on the other shift if necessary. The booking of P.N. at the end of duty was also discussed and other steps which to insure the retaining of miles to Seaford duties. Correspondence resignation of Bro. S. Cheal from the position of Branch Secretary. Organising Secretary N. Milligan explained that Bro. Cheal could not continue, and if a Secretary was not found the Branch would have to close. The matter was discussed at length, and a volunteer was found. Bro. V. Morris said he would take on Secretary so as the Branch would not have to close. L.D.C. Report Bro. C. Wickenden gave a detail report of meetings held 7th & 9th March with Sectional Council & management, also a joint scrutiny on the 21st March 1972 about the Redundancy of Seaford. It was fully discussed by the floor about the Redundancies; Bro. D. Creasey said he was quite happy about the situation. Members present Bros H. Allen, S. Cheal, D. Renville & V. Morris. L.D.C. Report Bro. 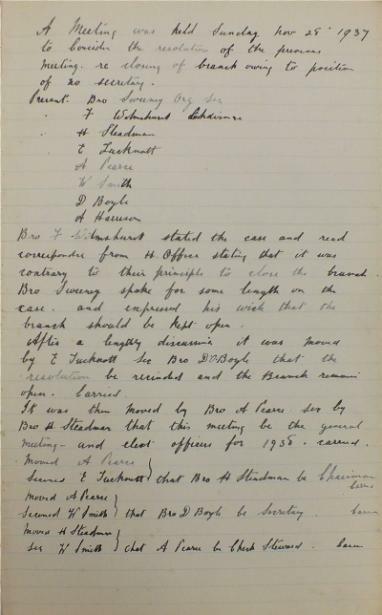 H. Allen gave detailed report of meeting held the previous day with management and Sectional Council, Brother G. Hilton Redundancy notice had been withdrawn and he would be going over to the opposite shift. Bros. Creasey and Wheeler to apply on the May vacancy list, for Brighton M.T. The Chairman opened the meeting at 6. 55 p.m.
All present stood in silence in respect to Dave, who is sadly missed by us all. Letter was read from Head Office expressing of deepest sympathy to the relatives. 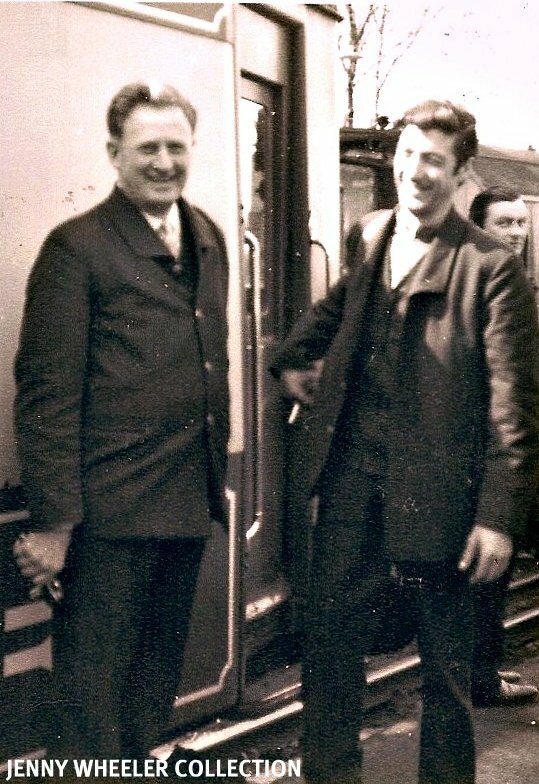 Left ~ Right: Jack (Sam) Rowe with (his brother) Jim Rowe Snr. They are receiving the Southern Region Staff Association trophy for crib pairs. On the back it's marked "British Railways (Southern Region) 18 MAY 68 F.B. Public Relations and Publicity Department. Waterloo Station S.E.1". 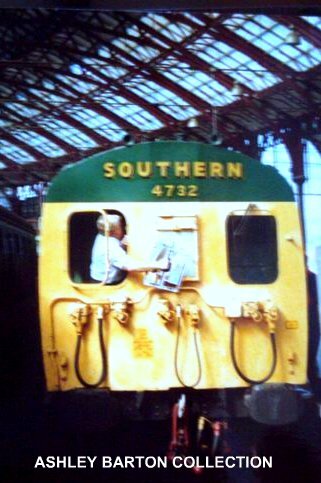 Jack transferred to Seaford on the closure of Ascot, in c1972. 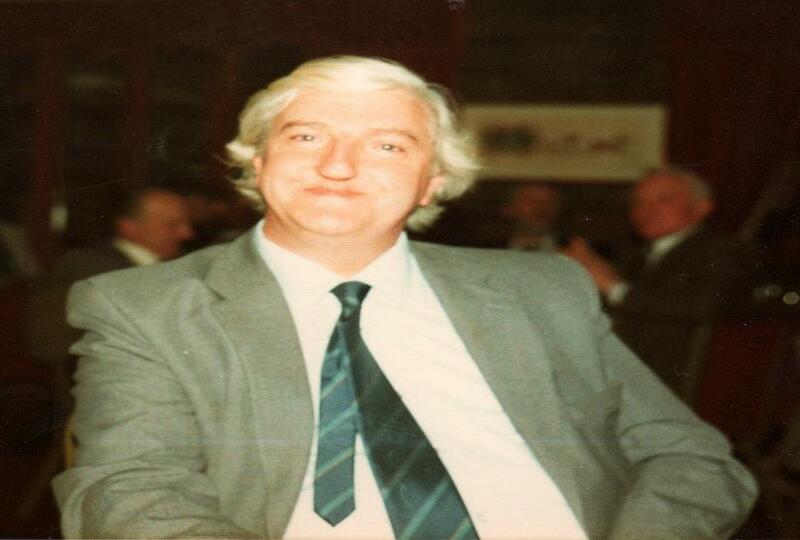 Jack retired from Seaford in c1984, when he moved back to Crowthorne and died on 28th June 1986, aged 67. Members present G. Hilton, S. Cheal, W. Mullett, H. Allen, J. Longmore, F. Wheeler, J. Rowe & R. Morris. The Chairman Bro. F. Wheeler welcomed two new numbers to the Branch, Bros. J. Rowe & J. Longmore. Secretary explained election of Officers for 1980 had been carried out. Correspondence, posted taken as read. Proposed by Bro. J. Rowe & Seconded by Bro. W. Mullett, that at least one Branch meeting to be held a year, or unless requested, also L.D.C. Chairman to call meeting when required. That this Seaford Branch gives a vote of confidence in our Branch Secretary, Bro R. Morris in complying with the wishes of the last Branch meeting and endorses his letter to Bro. W. Mullett dated 13th February 1980. Further, that Bro. J. Bowlden and D. Smith be transferred to No.1 and No.2 Brighton Branches as per rule 7, and that any matter deemed to be repugnant of insulting be ignored. Further, That this Branch demand that the E.C. 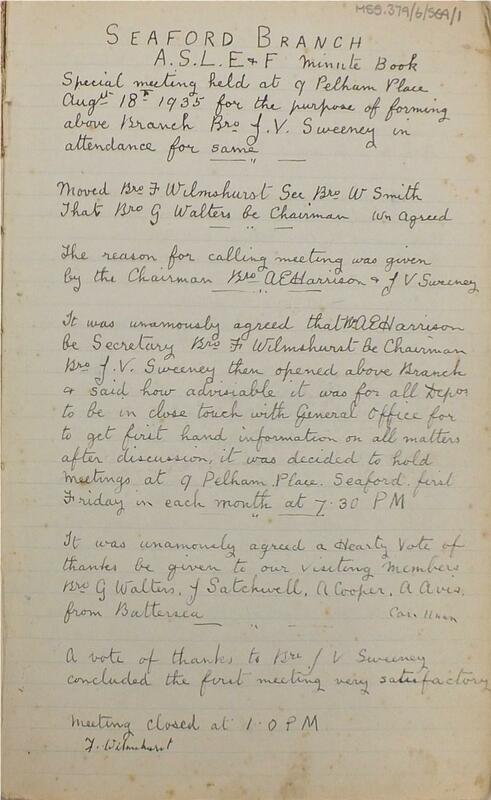 obtain all detailed information from Organising Secretary N. Milligan, as why he discussed and advised a Seaford member (unknown at the of this resolution) without the consent of the Seaford Branch Chairman or Secretary to hold another L.D.C. Representative election, which would include members of this Seaford Branch (not yet transferred under A.S.L.E. & F. Rule 7) who do not work at Seaford Depot, to be included in any L.D.C. Representative vote. Further, That our Branch Secretary forward the document containing 9 signatures, to be placed before the E.C. in order that such necessary steps can be taken to obtain a written apology from Seaford member Bro. W. Mullett for soliciting Seaford members to sign the enclosed document thereby contravening Rule 37 clause 4 paragraph 3 of the A.S.L.E. & F. Rules. 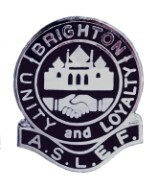 From 1980 ~ 1992 Seaford A.S.L.E.F members become part of the Eastbourne Branch. The crew of the Sealink Ferries (a subsidiary of British Rail) owned the car ferry 'Senlac' had staged an occupation of the ship which started on the 4th January 1982. This action was a direct result of the inability of the Anglo-French partners to negotiate a joint service agreement. 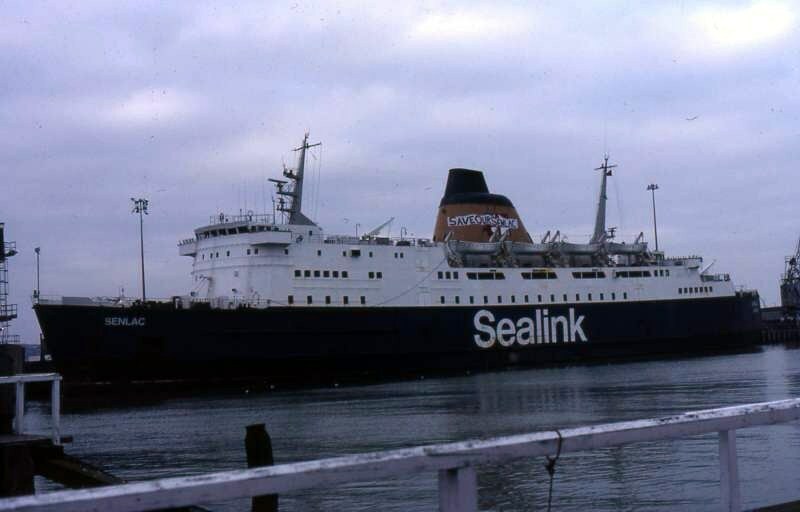 Sealink UK Ltd announced that they would be withdrawing ‘Senlac’ from the service and would leave it solely to the French and Senlac would be sold (Senlac was the only ferry operating on the Newhaven ~ Dieppe route that was owned the U.K.). Her crew promptly responded by occupying the ship and blocking the ramp at Newhaven. The dispute quickly spread and the ship's officers refused to move the ship, this left the ship being moored on the quay side until the occupation ended. The people of Newhaven and the surrounding area rallied around and gave their full support to the crew on the ferry, with donations of food and other essentials necessary for the ‘occupation’. Two large banners stating “Save our Senlac” and “Thanks Newhaven” were draped across the ship’s funnel and side. The A.S.L.E.F. 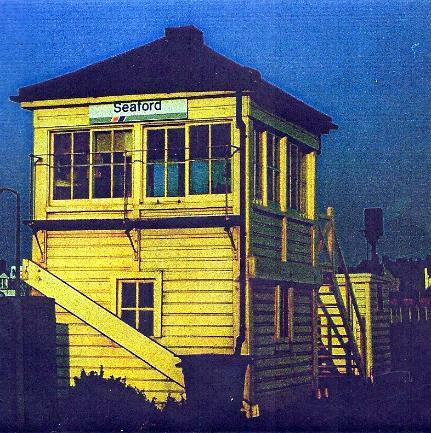 members of Seaford depot, gave their full supported to the occupation of the Senlac crew, with many of them having been worked at Newhaven Loco Shed and still lived in the town. 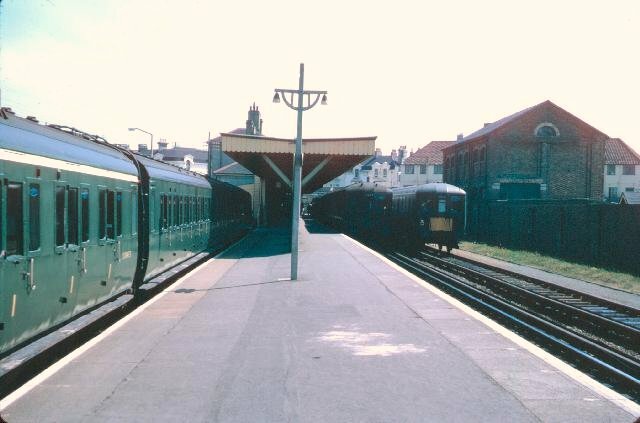 The ferry service from Newhaven, played a major part of the working life of Seaford depot, which involved Seaford depot working the ‘boat trains’ from Newhaven Harbour (Marine) to Victoria 'E' , which connect with the ferries arrivals and departures. In recognitions to the support given by A.S.L.E.F. 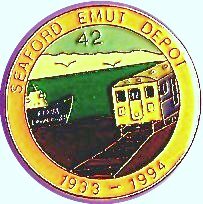 members of Seaford depot to this dispute, they decided to incorporate the ‘ enlac' ferry into their own depot strike badge some months later, which also shows them commemorating their 100% involvement in the 1982 A.S.L.E.F. strike. SENLAC made its last run between Newhaven and Dieppe on the 31st January 1985. The A.S.L.E.F. Executive Committee during their May 1992, session dealt with correspondence from the Staff Side, Secretary of LDC ’B’ Seaford, dated the 25th May 1992. The correspondence was regarding the re-opening of a Branch of A.S.L.E.F. at Seaford. 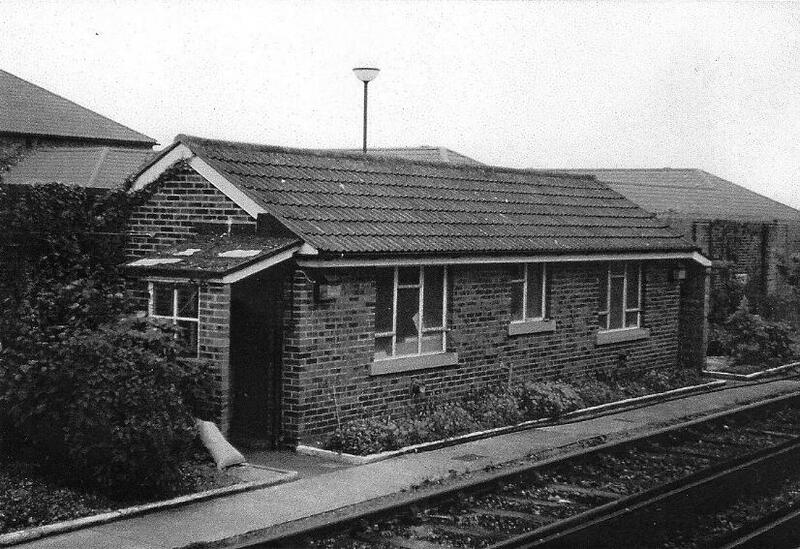 Len Warboys the District Secretary No.1, was instructed to investigate the feasibility of the re-opening of a Branch at Seaford and to report back to the Executive Committee. On the 23rd June, 1992, after considering the report from Len Warboys, the Executive Committee instructed Len Warboys to carry out the necessary arrangements for the reopening of the Seaford. Sunday 5 July 1992 become a very historical day. It saw the re-opening of the Seaford Branch (No. 180) after 11 years of closure. In attendance was ur District Secretary Len Warboys and there was 75% turnout of the Branch membership to mark this occasion which was held in the Sven Sisters public house, Seaford. Len was in the chair to open this inaugurate meeting. He said this as a very historical and good day for the Branch. He felt it would play an active role in the union. Then Len called for nomination for the Chairman. And Tony Allen, our Sectional Council member was voted in as Chairman of the Seaford Branch. Tony then carried out the election of the Branch business and the Standing Orders and he said thanks to the General Secretary and the E.C. for allowing the Branch to be re-opened and thanks to Len for coming to perform the actual re-opening. We also thank Eastbourne Branch for their comradeship and hospitality over the past 11 years and five months which was greatly appreciated by us all. 5 July was a very momentous and significant day to us all; one that will be long remembered by us all. & Richard Kemp (Vice Chairman). At the Seven Sisters Public House. & L. Warboys District Organiser. District Secretary L. Warboys in Chair. Chairman’s remarks on the re-opening of the Seaford Branch, after eleven years and five months of closure the Branch re-opened. To be recorded in these minutes the date the last Branch meeting was held. Thanks to the L.D.C. Secretary Stuart Fuller for his efforts in getting the Branch re-opened. Thanks to the General Secretary and the E.C. for allowing the Branch to re-open and also to the District Secretary Len for coming to perform the actual re-opening. Thanks to the last Branch Secretary Bro. 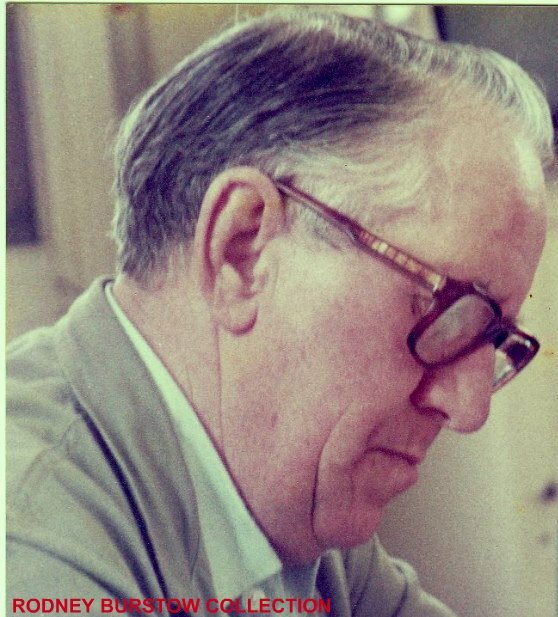 V. Morris, who is now retired for his efforts as the last Branch Secretary. I trust that this Branch may play an active role in the future of A.S.L.E. & F. Chairman asked bro Len Warboys to give a report. Report to Branch, felt good for the Branch to re-open and play an active in the union. Management for Attendance was brought in against the wishes of the union. Discipline has always been the way which absenteeism has been dealt with. To react to this new method will be difficult without recourse to current procedures. Even though representation has been made the unions are being ignored. 1, Now supervisors deals with this and arrange counselling if needed. 2, For 13 weeks absenteeism is monitored and if it is felt that attendance is not up to standard the local manager will deal with this with no representation. If it is felt that anyone is below standard he will be given a letter seeking improvement. 3 A final warning will be issued and if no improvement then a sacking will take place. It is hoped that this may be brought back under discipline. Rules update now 40 questions, without consultation with the unions. Previous system first stage was local manager and if any problem there was some support. Meeting held prior to the A.A.D. by delegates. Southern led discussion on Machinery. If discussion had not succeeded then the union would have been disenfranchised and no representation would have recognised. The Southern does not exist and each division will be on its own and will be on its own and have three Functional Representatives Sectional Council. On the questions of L.D.C.’s it is noted that a small depot will have only one rep. The L.D.C. would consist of one L.D.C. rep and one Health & Safety rep and this may be accepted by management. Management have even proposed a joint L.D.C. covering several depots. Negotiations of issues will continue. L.D.C.’s will need to put Health & Safety on the top of the list. Some concern of Functional Council reps being divided between London area, and Coastal areas. This leads to some being elected who may not be good enough for the job. Liaison will continue between all officers of the union to get the best representation. The business set up means that Hither Green a freight Depot would have an L.D.C. of 3 and Functional Council of 2. L.D.C. report, I wrote to the Depot Manager Mr. Brookshaw, requesting a meeting with Sectional Council in attendance and also diagrams regarding the loss of routes between Keymer Junction to Brighton on the Down road and also via Merstham on the Down road, from which I have only received a verbal reply saying that he does not see any point in calling a meeting as we not get any rostered diagram work on these routes until at least October when the Winter diagrams come in and this issue now is the hands of the Sectional Council. Members present M. Allen, S. Fuller & S. Holder. That this Branch instructs the Branch Secretary to write to the General Secretary, ASLE&F. Advising him that this Branch rejects the concept of joint L.D.C.’s and even in the event of numbers of representations being more than one. That this Branch instructs the Branch Secretary to write to the General Secretary, ASLE&F. Advising him that this Branch rejects the concept of Division on thee former Southern Region being split into area’s for representatives at any level Representatives for Division’s should be elected on nomination and ability only. Meeting held 13th December 1992. Members present M. Allen, S. Fuller & G. Caulfield. That due to the action of the E.C. in relation to the current Profit Centre elections, in debarring our Branch from nominating, and voting in the election and not allowing more than one nominee from anyone Branch to hold office at Profit Centre level. We request an urgent meeting of all Branches with the Executive Committee. No nominations for any post received. At the meeting held 13th Dec. 1992, under the election of officers. I regret to inform you that no member was prepared to be nominated for any post. This was as a direct result of the Executive Committee actions in relation to the election of Profit Centre representatives. Namely the debarring of members of this Branch from nomination and voting in such election and in violation of A.S.L.E. & F. society rule. We would also advise you that there is total objection to decision by the Executive Committee not to allow any Branch from nominating or having two Profit Centre Representatives. Seaford depot worked a "4 SUB" and a "2 BIL" formation during the Summer of 1991 (?). Both these units where built in 1936 or just after. The 4 SUB units commonly known as MARYS by the drivers that worked them and spend most of their working days in the London suburban area of the Southern Railway/Region. The 2BIL untits spent their working lives along the coastal rouites as well as within the London area. Both units are preserved by N.R.M. 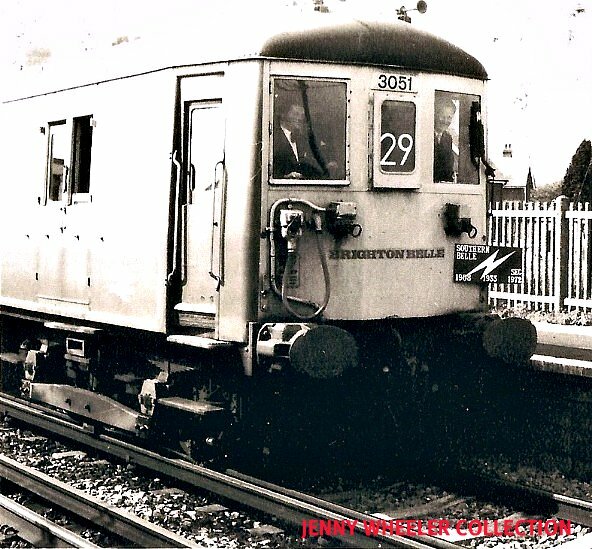 The service only run during the daytime between Brighton & Seaford as part of the Celebration of 150 years of the Brighton Line in 1991. Left Richard Kemp having just arrived at Brighton taking down the stencil. 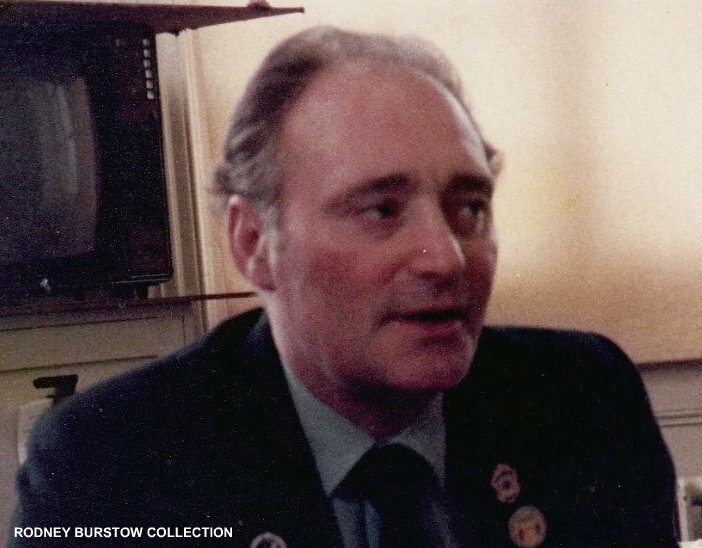 That following the election of officers on 21st March 1993, grave concern is expressed at the lack of response to the situation which has arisen at this Branch, namely failure to get any officers for the Branch for 1993. The Executive Committees failure to responded to the resolutions previously passed is noted and the Branch Secretary is instructed to write to the Executive Committee advising them of our election of officers and further that this has happen at the advice and recommendation of our District Secretary and wishes of the members of this Branch. However the Executive Committee is condemned for their failure to respond to the situation at this Branch from 1st. 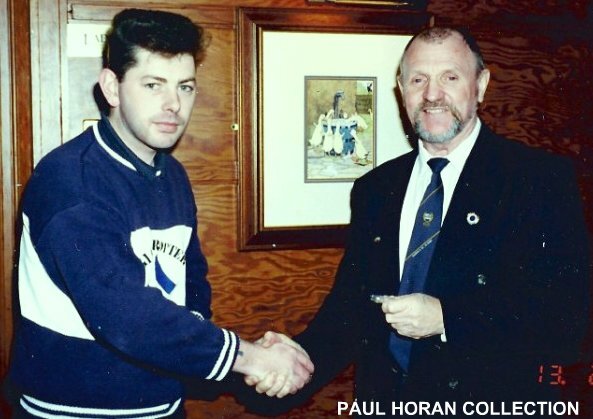 1993 to 21st 1993 and failure to apply the Society rule book. Above left are the opening minutes of the Southern Region Sectional Council "B" Sub-Committee meeting & the opening minutes of the full Southern Region Sectional Council "B" meeting. Both sets of minutes highlight Tony Allen first appearances onto Sectional Council in these two different forums. 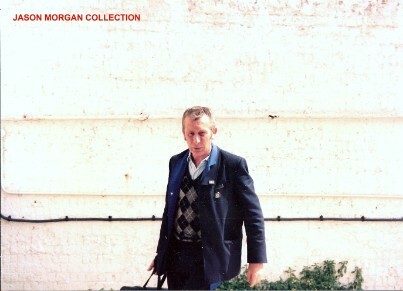 & G. Morris Divisional functional Council. Len gave and spoke on the importance of the Alcohol & Drug Policy, and he could not stress it enough as there has been 3 drivers sacked recently regarding alcohol, one who was 51 years old. He said he knows it is not fair as the law of the land is 80 milligrams for car drivers and 30 milligrams for B.R. staff you will be breath. Bill said the ban on Rest Day working and overtime could serve no useful purpose on S.R. and when the ballot comes to vote according to your views if that even means voting against as there’s not much support from the branches. Roster Sundays, working rostered Sundays was part of the D.R.I. prossals that you must find a substitute. In 1972 N.U.R. were shut out on rostered Sundays, we are going to ask legal advice on this issue. We are in the view that drivers are entitled to their Sundays off, as there are plenty of drivers who could do with extra cash. Functional Council Depots on list C.
The only reason that Seaford is on List C is there is no Supervision. All depots on the South Central where there is no Supervision are on List C. Seaford Closure, the closure date of the 24th Jan. does not coincide with the footplate vacancy list. Pay without a ticket, (ticket less pay), there is a pilot scheme in operation; depots are Eastbourne, Norwood & Seaford. At the end of the pilot scheme it is expected that the rest of the depots will follow suit. Many questions was asked from the floor at the meeting which were debated, some in great detail. The Secretary then on behalf of all the Seaford Branch gave a vote of thanks to our District Secretary, Len, E.C. Member, Bill, and D.F.C. Member, Graham. 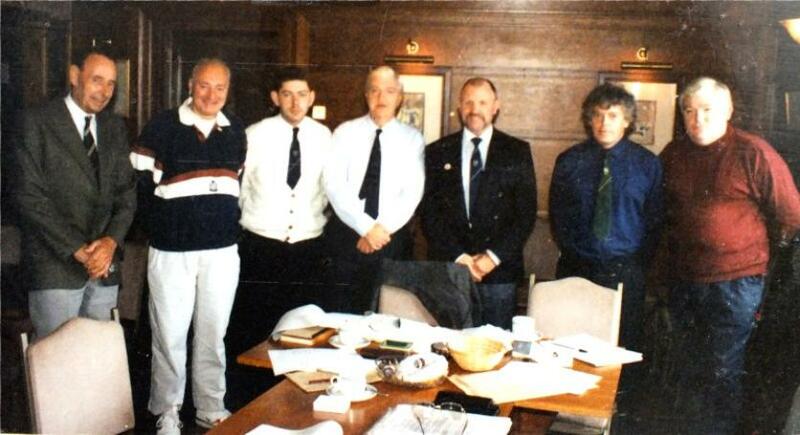 Meeting held at Brighton with DFC on 26th October 1993. Statement of intent, we were advised that Seaford Depot closure was expected to coincide with the January P.A. on January 24th ’94, and D.F.C. would be meeting all drivers at Seaford with the L.D.C. to advise and explain the P.T.R. arrangements. 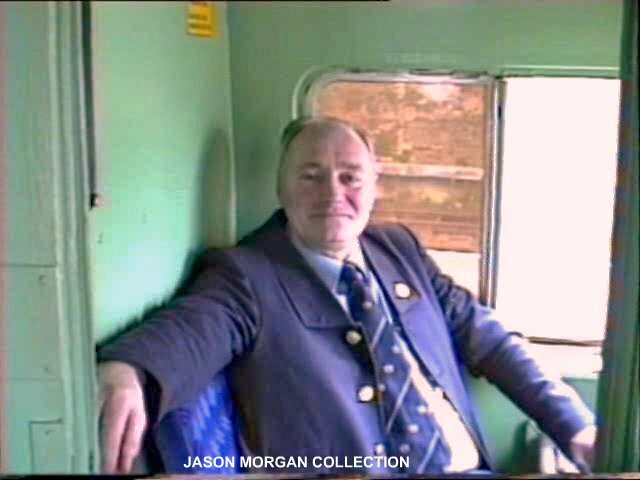 Meeting held December 13th 1993 at Brighton, in attendance were the Divisional Train Crew Manager, Train Crew Manager, Diagrams, List Clerk, Brighton & Eastbourne L.D.C.s and D.F.C. We were informed that there will be jobs for Seaford drivers, 5 Brighton & 8 Eastbourne. All the Seaford diagrams are to go to Brighton and Brighton to release 2 diagrams to Eastbourne. The Divisional Train Crew Manager again assured that all Seaford drivers would be offered a drivers post at Brighton and Eastbourne. 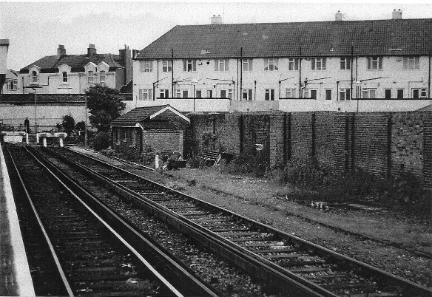 The re-opening of the Seaford Branch was to be short lived and within eighteen months, the Branch along with the depot had finally closed. 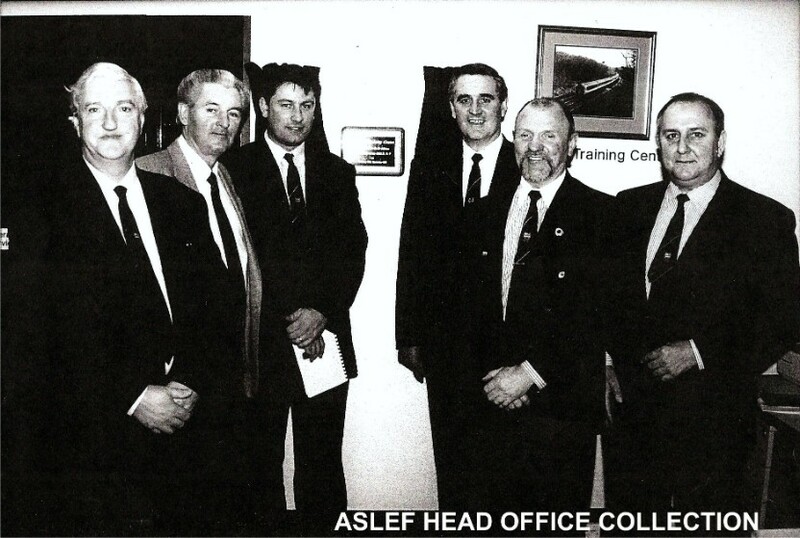 On Sunday 13th February, 1994, Len Warboys returned back to Seaford this time to offically close the Branch after 59 years of A.S.L.E.F. activities at Seaford. 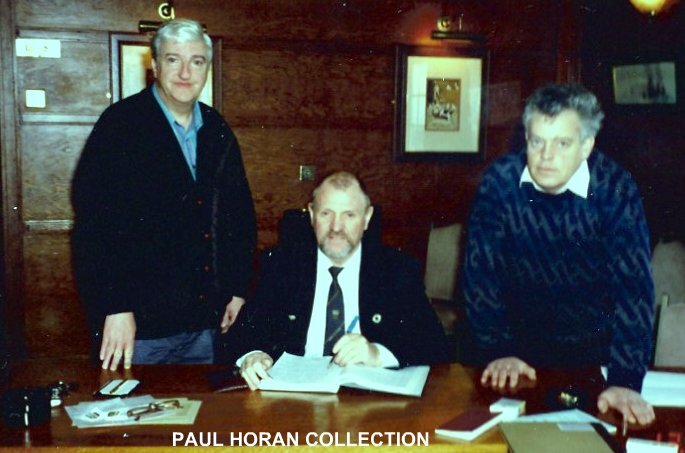 Last meeting held on Sunday 13th February 1994. Members present, S. Fuller, M. Allen, P. Horan, C. Gent & S. Holder. Also in attendance District Secretary Len Worboys. 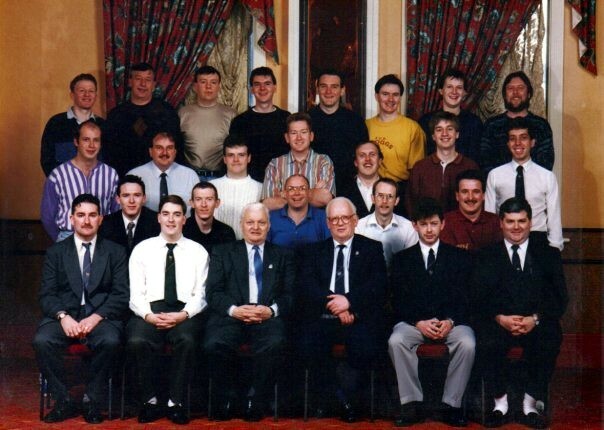 On the 6th January 1994 the Divisional Functional Council were present, along with the L.D.C. at Seaford depot to meet all drivers to advise and explain the options open to drivers under the P.T.& R. arrangements of the closure to Seaford. The personal interviews took place on the 10th & 11th January at Brighton under the P.T.& R arrangements. On the 15th January met the Eastbourne L.D.C. at Brighton to place all drivers on the roster who had transferred there and to place the extra Sundays on the roster, from which this was carried out by the Eastbourne L.D.C. On the 22nd January 1994, met the Brighton L.D.C. to place all men on the roster there and they were placed in the correct links. on Sunday 13th February 1994. Stu Fuller entered the footlpate grades on the 19.10.1964 at Hither Green. Stu transfered to Addiscombe to gain his promotion to driver and later transfered to Seaford in the late 1980s. Whilst at Seaford Stu helped to re-open the Seaford A.S.L.E.F Branch and become the Branch Secratary. Stu also served on the Seaford L.D.C. 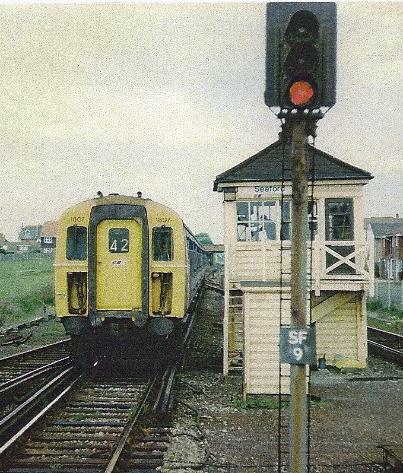 up until Seaford's closure in February 1994. Paul Horan is presenting Stu with an informal retirement gift (in 2008) of a painting of Seaford station post 1935. 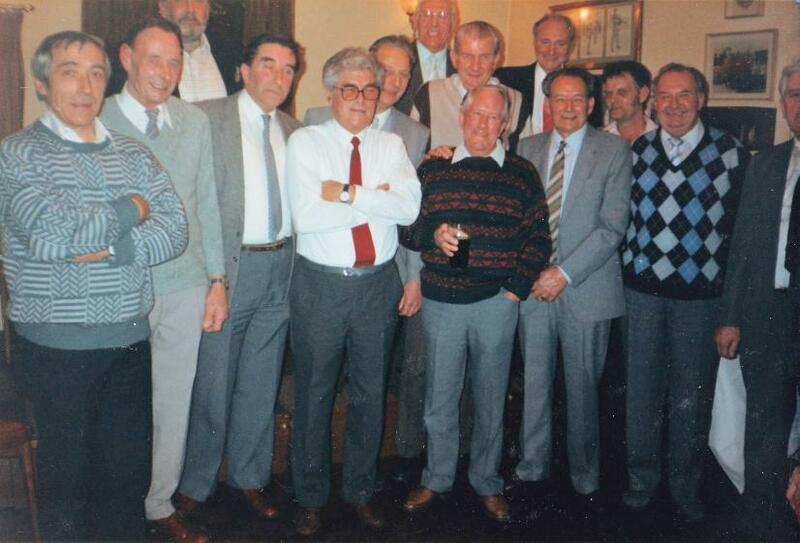 Brighton Train Crew Fund Social of 1991.